DUMBARTON had to battle to win through to the second round of the Scottish League Cup at rain-soaked Glebe Park, Brechin. DUMBARTON had to battle to win through to the second round of the Scottish League Cup at rain-soaked Glebe Park, Brechin, in front of a crowd of 374. The division one side made a real contest of this cup tie, but eventually lost to a close range goal from Sons skipper Andy Graham after a long throw midway through the second half. Honours were even in the first half, but chances were few and far between. 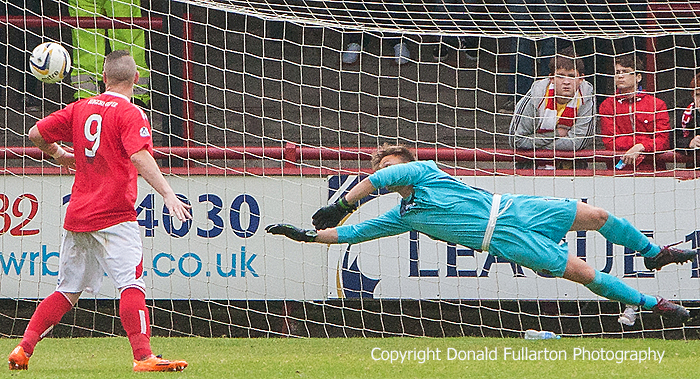 Mark Gilhaney and Bryan Prunty came closest for Sons, while at the other end newly signed keeper Danny Rogers, on a six month loan from Aberdeen, saw one strike come very close. After the break the visitors were playing uphill, and found themselves under pressure from repeated Brechin raids. But Rogers produced one stunning save (pictured) and the defence marshalled by Graham and Lee Mair held out confidently. Colin Nish headed home a second, but ref Kevin Clancy ruled that he had fouled a defender and awarded a free kick.